In observation of the upcoming holiday this week our office will be closed both Thursday (Nov 26th) and Friday (Nov 27th). We will return to the office this coming Saturday the 28th. Our hours on Saturday will be 9am - 1pm. The Doctors and Staff at Sheldon Road Chiropractic & Massage Therapy would like to wish everyone a happy and safe holiday! Remember when "A spoonful of sugar helps the medicine go down" was the catch phrase of the day? Well, soon it might be, "A spoonful of honey means you don't need any medicine," because research suggests honey is an effective remedy for childhood cough. While we're mired in the thick of another cold and flu season, it's time to remind parents of two important points: First, the Food and Drug Administration says cough and cold medications are not appropriate for children ages 6 and younger and may actually be dangerous; and second, research suggests honey may be the best treatment of all for helping children suffering from cough and related symptoms. Let's deal with the safety issue first. Over the past several years, the FDA has progressively investigated over-the-counter cough and cold medications, many either with dosing instructions for adults and children or for children only, depending on the type/brand. With little research done involving children only (after all, what parent would want their child to be the guinea pig in one of those studies? ), the general protocol was for dosing recommendations to be extrapolated from adults to children. In other words, there was little to no hard data providing any sort of a basis for how much of a given cough/cold medicine should be administered to children - or if it should be administered at all. Eventually, the FDA figured this out and ruled that cough and cold medicines were inappropriate for children under the age of 2, then extended the ban to children under age 6 (and is considering a ban up to age 11, if not older). In the past year or so, even the medications still considered appropriate for the 6-plus age group (at least for now) have come under fire, with more than a few product recalls for quality-control issues that resulted in a number of products (cough and cold, allergy, fever) made by several drug manufacturers being removed from the shelves for several months in 2010. Wouldn't it be great if our kids had something natural to help them get rid of those nasty coughs, or at least minimize their duration? Well, perhaps they do: honey. For example, in a 2007 Pennsylvania State University College of Medicine study involving 105 children ages 2-18 with upper respiratory infections, children who were given buckwheat honey (between 1/2 and 2 teaspoons prior to bedtime, depending on age) coughed less and slept better than children who did not receive any honey or who received honey-flavored dextromethorphan (the primary active ingredient in many cough and cold medications). Talk to your doctor for more information, and keep in mind that honey is not recommended for children in their first year because it may contain botulism spores, which can be harmful to young children's underdeveloped immune systems. As technology advances, so do the chiropractic techniques at Sheldon Road Chiropractic & Massage Therapy. Instrument adjusting has become the fastest growing form of chiropractic manipulation due to its ease of use for Dr. Kollias or Dr. Karen and the safety to their patients. It can take quite a bit of effort to perform a properchiropractic adjustment, and most chiropractors can attest to having suffered any number of shoulder, back and wrist injuries from treating patients over the course of their practice. An Arthrostim® adjustment involves the use of one of these special instruments. It has an appearance similar to a drill, and is held in a similar manner. What it does is produce a speedy thrust and recoil motion, similar to the way a chiropractor uses their hands to adjust the vertebrae in your back. The benefit of the instrument is that it performs this high-velocity, low-amplitude motion 12 times per second, and is targeted to a very small area. The force of the thrust radiates through the joint and the tissues that surround it, releasing trigger points that are often the cause of muscle spasms. As opposed to traditional chiropractic adjustmenttechniques, use of the Arthrostim® does not cause the same popping and cracking noises in the joint that can make some people feel uneasy. It is a gentle, mechanical method of easing the joints back into alignment that is basically an extension of our chiropractor’s hands. Our chiropractors can exert just the right amount of pressure needed by adjusting the force of the thrust up or down from merely a few ounces all the way up to 40 pounds, and it works on a wide range of body areas, not only on the spine. The Arthrostim’s® movement stimulates the patient’s special sensory nerve receptors, called proprioceptors, which are responsible for detecting the proper motion and alignment of the body’s muscles and joints, signaling that all is well; however, at the same time it avoids stimulating the nociceptors, the sensory nerve receptors responsible for sending pain signals to the central nervous system. The use of instrument adjusting, such as with the Arthrostim®, allows for fewer side-effects and less post-treatment muscle soreness. If this seems like a form of treatment you may be interested in, consult with Dr. Kollias or Dr. Karen and ask if it may be possible to incorporate Arthrostim® adjusting into your treatment regime at Sheldon Road Chiropractic & Massage Therapy in Tampa. It’s a great success story that most of us probably haven’t heard very much about. America’s roads have become far safer across the past 20 years. By just about any measure, travelers are much less likely to be injured or killed in a motor vehicle accident than they were in the late 1980s and early 1990s. Vehicle Miles Driven-- Americans traveled 2,172 billion miles in 1991 and 2,979 billion miles in 2009. That’s a 37% increase. Motor Vehicle Accidents-- During the same 1991-2009 period, the number of accidents on U.S. roads actually decreased by 10%, dropping from 6,117,000 to 5,505,000. So even though we’re traveling more miles, we’re having fewer accidents. Occupant Fatalities-- The number of motor vehicle occupants killed in accidents during 1991 was 31,934. That number declined by 23% to 24,474 in 2009. The fatality rate per 1,000 accidents dropped from 5.2 to 4.4 persons. That means that when we do have an accident, it’s become less likely that someone traveling in the vehicle will be killed. Occupant Injuries-- The statistics show an even more positive trend with respect to injuries. The number of occupants injured in accidents fell 29% from 2,850,000 in 1991 to 2,011,000 in 2009. The injury rate per 1,000 accidents declined from 465.9 persons to 365.3. 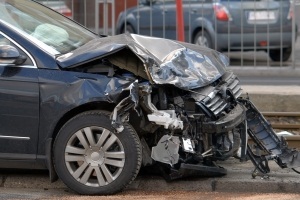 Simply put, our motor vehicle accidents seem to be injuring fewer drivers and passengers when they do occur. It’s likely that this general trend toward safer roads is being driven by a combination of factors. It could be the way we’re driving that’s producing fewer, less serious crashes. It could be the way our roads are designed, maintained or policed. It could also be the active and passive safety features now included in many of our vehicles. But whatever the reasons, we can all agree that this is good (if under-reported) news for our nation’s travelers. But What if I’m One of the Two Million Unlucky Ones this Year? As encouraging as this trend is, it obviously means little to you if you or someone you care about is actually injured in a car accident. Even in cases where drivers and passengers walk away from a wreck believing they’re “uninjured”, auto accidents can have profound, long-lasting health consequences for those involved. It’s not uncommon for some types of symptoms to appear only gradually days or weeks after the event itself, delaying effective diagnosis and treatment. Symptoms may also come and go intermittently, making it more difficult to associate them with the accident. Fortunately, there are things you can do to safeguard your health and improve your chances of a more rapid, complete recovery following an auto accident. Clinical studies have demonstrated that chiropractic care can shorten recovery time and decrease the amount of permanent physical damage sustained in a collision. Take Care of First Things First. Always address any life-threatening injuries first. If you experience (or have reason to suspect) significant bleeding or bruising, broken bones, internal pain, difficulty breathing, loss of consciousness, or shock, you should seek immediate help from healthcare professionals who specialize in treating trauma injuries. Recognize Signs that You May Be at Increased Risk of Developing Chronic Problems. A prior history of back, neck or shoulder problems (including previous injury). Distinct numbness, tingling or pain immediately following an accident. Increased muscle tension or reduced range of motion after the crash. You were involved in a rear-end collision. Your head was turned at the moment of impact. You have symptoms that don’t resolve or that become generalized. Visit Sheldon Road Chiropractic as Soon as Possible After an Accident. Do this even if you don't think you've been hurt very badly. Research has shown that early intervention in the form of chiropractic adjustment, massage and supervised exercise and stretching programs can make a big difference in longer-term function. Activity encourages blood flow to the injured area and promotes healing. It also helps prevent or reduce scar tissue formation and maintain range of motion. Strengthen the Affected Area(s) as Directed by your Chiropractor. Exercise and stretching programs are designed to help prevent future injuries and are an important part of a balanced treatment plan. An auto accident can affect your health (and your lifestyle) for years if you don’t receive the proper treatment. So if you or someone you care about has been injured in a collision, please call Sheldon Road Chiropractic & Massage Therapy in Tampa and make an appointment today. Chiropractic care can help put your recovery in the fast lane! Mayo Clinic Comprehensive Guide to Diseases and Conditions: Whiplash and Alternative Medicine. Accessed August 2011. Berglund A, et. al., The influence of prognostic factors on neck pain intensity, disability, anxiety and depression over a 2-year period in subjects with acute whiplash injury. Pain. December 2006. Jull G, et. al., Does the Presence of Sensory Hypersensitivity Influence Outcomes of Physical Rehabilitation for Chronic Pain? A preliminary RCT. Pain. May 2007. Karnezis IA, et. al., Factors Affecting the Timing of Recovery from Whiplash Neck Injuries: Study of a Cohort of 134 Patients Pursuing Litigation. Archives of Orthopeadic and Trauma Surgery. October 2007. Peolsson M, et. al., Generalized Pain is Associated with More Negative Consequences than Local or Regional Pain: A Study of Chronic Whiplash-Associated Disorder. Journal of Rehabilitation Medicine. April 2007. Rosenfeld M., et. al., Active Intervention in Patients with Whiplash-Associated Disorders Improves Long-Term Prognosis. Spine. November 2003. Sterling M., et. al., Physical and Psychological Factors Maintain Long-Term Predictive Capacity Post-Whiplash Injury. Pain. May 2006. 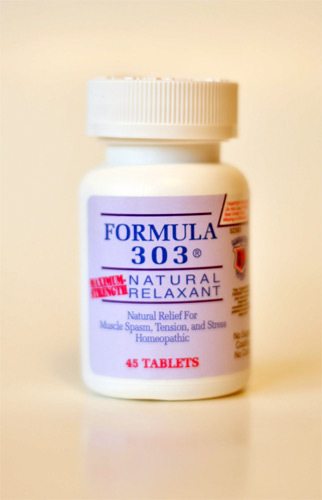 Our office is now carrying an all natural, homeopathic MUSCLE RELAXANT called Formula 303. Ask our Doctors to see if this is a great option for you! All natural formula that has been used and recommended by over 6,000 Chiropractors to bring fast relief to their patients! Is 100% safe, non habit forming, with over 44 years of proven results. Over 2 million people and counting have relied on and trusted Formula 303 to feel better fast. Professional strength formula that works without a prescription to make your patient’s mind and body feel good once again.